For children, no birthday party would be complete without party favor bags chock-full of toys and treats. For the parents throwing the party, however, party favors aren’t always as fun. Putting together goodie bags for all the party guests can get complicated and expensive quickly, so we have come up with tips to take the stress out of the process. Creating party favor bags can be easy, enjoyable and affordable! Keep it simple and use plain brown paper lunch bags to hold your party favors. Have the birthday boy or girl decorate each bag with markers, sponge paints, ribbons, glitter or stickers, writing the name of a guest on each bag. If the party has a theme, you can decorate the bags to match – for example, pineapples and hula dancers for a luau or spaceships and aliens for an intergalactic bash. Attach a colorful personalized folder to each bag with a paper clip. Fill the folder with coloring book pages, stationery or crossword puzzles. For extra pizazz, include a sheet of personalized stickers, only $3.95 for a sheet of 12 stickers. Guests will be thrilled to take home sticky souvenirs featuring their own names. Bake a batch of delicious homemade treats-cookies, brownies and cupcakes are always crowd-pleasers- and include a few in each favor bag. 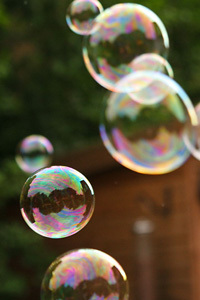 Make your own bubbles (using one of these great recipes) out of a few household ingredients, and pour them into small bottles from a craft store. Twist pipe cleaners into colorful bubble wands, tie each bottle with a ribbon, and voila! Buy gift cards from local stores in small dollar amounts ($5 or less) good for video rentals, frozen yogurt, or other indulgences. Take a photo of each child at the party on a digital camera and print out copies on glossy paper using your home printer. Have party guests glue the photos of themselves onto pieces of cardboard and decorate to create simple, homemade frames.